The NSW government is considering withdrawing consent for development company CSKS Holdings to develop publicly owned land in Paddington and has referred the handling of the company's Crown lease to ICAC. Ministerial consent was granted last year for a development application for a two storey child care centre to proceed but after the government received the findings of a review into the Crown lease last week, the Head of the Department of Trade and Investment Mark Paterson wrote to Woollahra Council stating that "had the Review Report findings been known at the time landowner's consent was sought, it is doubtful whether it would have been recommended. The department is considering whether consent can be withdrawn at this stage." Paterson's letter suggests that the findings, which have not been made public, are serious. ICAC will now investigate how a perpetual lease on the site occupied by the Paddington Bowling Club was turned into a 50 year commercial lease and then transferred to developer Christian Sanchez's CSKS Holdings. It is also likely to review an earlier Liquor and Gaming Commission of Inquiry into whether there had been corruption or improper conduct in relation to the site and what happened in the aftermath of the earlier Inquiry report. Woollahra Councillors will consider the development application at a Development Committee meeting on Monday night. Even before Council received news of the ICAC referral, the application was expected to be referred on to a full Council meeting. That is now a certainty. Two figures already familiar to ICAC played a role in the Paddington deal, ex Labor Planning Minister Tony Kelly and the previous head of the NSW Lands Department Warwick Watkins, both of whom were found to have acted corruptly in relation to another Sydney land deal. Kelly is also under investigation for his role in approving a doctored cabinet minute in favour of infrastructure company Australian Water Holdings. This week, Shoebridge said that the government should "immediately withdraw consent until the matter is dealt with by ICAC. It is essential that the development does not proceed any further while there is a cloud hanging over the integrity of the development process." Greenwich also wrote to Council last week asking it to defer consideration of the development application until after the ICAC investigation. Stoner's decision to review the lease was precipitated by a meeting initiated by two Woollahra Councillors ex Mayor Andrew Petrie and Deputy Mayor Katherine O'Regan and members of Stoner's staff at which the concerns of councillors and residents were discussed. The government's decision confirms the long term view of Petrie who told me in March that the issue is one in which private interests have been allowed to benefit from “underhand dealings with the government to the exclusion of the public”. O'Regan told the Daily Telegraph last week that, "At the moment I think there is a moral obligation that we defer a decision on the application until the finalisation of matters involving the ICAC.” Greens Councillor Matthew Robertson had already argued that Council should defer any consideration of the development until the review was completed and undertake its own report on the affair. 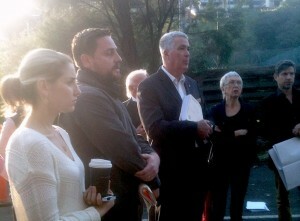 In early 2014 Christian Sanchez (second from left) met residents and Councillors at an early morning meeting to discuss parking issues. How did CSKS Holdings get hold of open space Crown land? The story of how the open space public land fell into the hands of property developer CSKS Holdings (previously called Woollahra Gardens Pty Ltd) goes back to 2000 when Paddington Bowling Club got into financial difficulties. Controversial liquidator Andrew Wily was appointed as administrator and played a major role in the handling of the Club and signed the transfer documents in late 2011 on behalf of the Club. Wily was suspended as a liquidator in 2004 and is currently being investigated by the NSW Fraud squad for his involvement in other company liquidations. Wily introduced his business associate Eastern suburbs developer Michael Sanchez who saw the site as a development opportunity. He signed an agreement giving him an option to purchase the publicly owned site and his daughter Vanessa Sanchez and son-in-law Marcus Levy became involved in running the club. In 2006, Lands Minister Kelly agreed to sell the site to Club for what was seen as a low price. Wily's plan was to onsell it to Sanchez's Woollahra Gardens, now CSKS Holdings. Michael Sanchez who went bankrupt after a series of failed developments later handed the company over to his son Christian Sanchez. There was no tender for the sale proposal which was contrary to government guidelines. When Woollahra Councillors, who had been kept in the dark, found out about the proposed sale of Club site, they were furious. The Club site is adjacent to Trumper park which the Council manages on behalf of the Crown. Why, they asked, had they not been involved in discussions earlier? Petrie and others strongly opposed the sale and successfully agitated for a Commission of Inquiry into whether there had been corruption in the dealings over the site. After a court case challenging the powers of the Inquiry, the Commissioner Brian Guest could only make factual findings rather than findings about whether corruption had occurred. The Inquiry found that the Club had paid large fees to Sanchez's relatives and Wily had failed to investigate a million dollar claim by Sanchez's company which kept the Club insolvent for many years. By the time of this earlier Inquiry, Kelly had withdrawn his consent for the sale. But the Inquiry was told that behind the scenes the President of the Club Brian Kirk, who also works for the Sanchez family development companies, continued to negotiate to take over the Club lease. Lawyers representing the Sanchez family and the Club objected to his evidence about these negotiations being given in public. The Commissioner agreed to a secret hearing. When a member of Friends of Quarry Street applied under Freedom of Information for records of this crucial evidence, she was told that no records existed. This is one of many matters that may have concerned external lawyers reviewing the handling of the site. The Inquiry hearings had been reported by the SMH and Wentworth Courier but strangely the final report completely flew under the media radar. The first report of the earlier Inquiry findings was published on this blog. After the Inquiry, the Kirk and others continued to negotiate with the Crown Lands department for a small public road that provides access to Trumper Park and Council and community facilities to be added to the Paddington Club site. The Crown lands department favoured this move. The Council strongly opposed it but eventually agreed to allow the Club to lease part of the road from the Crown. This increased the development potential of the site. Behind the scenes, the Sanchez family were still waiting to take over. On one occasion, Kirk was so overbearing at a meeting with Councillors and staff, the meeting was closed down. A story with a more detailed account of these events was published on this blog in March. There have been serious ongoing problems with the Paddington Bowling Club site including multiple licensing complaints, some of which have been upheld. Licensing compliance officers are currently investigating the finances of the club which appear to have been maintained in a way that kept the Club under administration until the lease was transferred to CSKS Holdings. Council records include a note that a NSW policeman told an ex Council officer David Sheils, who had originally blown the whistle on the sale, that police who had been involved in the earlier Inquiry were disappointed that no action was taken after the report was completed. The events which followed the 2008 Inquiry were part of the terms of reference for the recent external lease review. Earlier in the year a Club official told me that Sanchez's son in law Marcus Levy who was found by the Inquiry to have received huge consultancy fees from the Club while he was its Secretary continued to be paid by the Club although he had officially stepped down as secretary and become a well known Sydney publican. This arrangement which continued until the Club went out of administration and the land was transferred to the Sanchez company. Brian Kirk: planner, consultant and Club President. Brian Kirk was heavily involved in negotiation about the land and signed the transfer documents. From 2004 until this year, he was President of the Paddington Bowling Club, He stepped down at a long over due annual meeting held this year. He also happens to be a planner for the Sanchez family and was responsible for expert work on the current development application. He commissioned a controversial parking study which residents believe is inadequate. His apparent conflicts of interest may be relevant to the ICAC Inquiry. His role in the development provides is likely to provide additional ammunition to those arguing for the development application to be put on hold, should that be needed. The actions of several Crown Land staff are bound to be scrutinised by ICAC. It was on the basis of their advice that the land was transferred to CSKS Holdings for a dollar on New Year's Eve. 2011. Minister Stoner later gave approval for a mortgage on the land that was also taken out on December 31, 2011. When Greenwich and Shoebridge asked questions about the 2011 transfer earlier this year, the answers which were presumably prepared by Crown land officers were odd. Crown land officers gave evidence at the 2008 Inquiry. Nevertheless, the Minister told parliament that Crown lands officers were not aware of the Inquiry when they recommended that the lease be transferred to CSKS Holdings. Why was that information not in the file? Asked about 'due diligence', Crown land officers advised the Minister to replay that a basic ASIC search had been carried out on the company. Is the only 'due diligence' undertaken when leases on public land are being transferred to private companies, really only a basic name check? In any case, even this search would have revealed that CSKS Holdings was the same company as Woollahra Gardens Pty Ltd which the Crown officers claim not to know. An earlier blog post includes more analysis of the questions and answers. The parliamentary questions and answers were yet another smoking gun in this tangled web of events. Can you develop a for-profit child care centre on Crown land reserved for public recreation? Despite huge community opposition, Council officers have up until this point recommended in favour of CSKS Holdings' development application. Now a serious legal issue that seems to have been forgotten has come to the fore. Should Crown land set aside for public recreation have ever been approved by the Crown and Council as appropriate for a for-profit child care centre. This issue has been confused by the Woollahra Council Land and Environment Plan ( LEP) which like some others in Sydney allows for child care centres to be built on land zoned 'open space.' But the land leased by CSKS Holdings is not just open space; it is Crown land held on trust for public recreation. I dealt with this issue in my post on the Talus Trust in which retired lawyer John Owens has brought the Randwick Council v Rutledge line of cases to the attention of Willoughby Council and the NSW Government. In Rutledge the High Court found that all Crown reserves held on trust for public recreation must remain open to the public generally as of right and not be a source of private profit (unless all the profits are reinvested in the public purpose). Owens’ views on these Rutledge Principles have now been confirmed in a written opinion to Willoughby Deputy Mayor Coppock from preeminent trusts expert, ex-Federal Court Judge Raymond Finkelstein QC in respect of the Talus Trust for public recreation. Rutledge has been applied in many cases. For example, in a case in which the Coffs Harbour Environment Centre Inc. sued Coffs Harbour City Council, the NSW Court of Appeal went so far as to deny sewerage works on land held on trust for public recreation. Similarly in Waverley Council v Attorney General the Court of Appeal stopped the proposed “Splashers Club” at the old Bronte swimming club. Owens has urged Woollahra Council to consider this line of cases when exercising its powers in relation to Trumper Park. He argues that the provisions of the Environmental Planning and Assessment Act relating to the preparation and adoption of “Local Environmental Plans” and DAs approvals shouldn't be allowed to subvert clear principles of trust law. In other words, if a particular parcel of land is held on trust for a specified purpose, that should not be defeated by some other general LEP. He told me, "If the land is in truth held on trust for “public recreation” and/or related or ancillary “community purposes”, that is the beginning and end of the matter" (unless the Government varies that public trust in accordance with proper procedures). Owens has also queried how a lease of Crown land for “public recreation” could ever allow the construction of a commercial childcare centre on the trust property. Owens says any lease over Crown land held on trust for public recreation is necessarily limited to that use: public recreation. Councillors and residents are likely to raise this long standing line of cases with Council, as well as the ICAC investigation, tonight. What now for Christian Sanchez? Back in 2002 when the Sanchez family saw on opportunity to get a cheap publicly owned prime site, they dreamed of a high rise residential development overlooking Trumper Park. Now Michael Sanchez is bankrupt. He and Christian have being involved in several failed developments which ended up in foreclosures and expensive court cases. For Christian Sanchez, for-profit childcare was an acceptable fall back option. Who knows what CSKS Holdings had in mind for the rest of the Paddington Bowling Club site should the Club go out of business? Back in February, Christian Sanchez told me the only issue currently at stake is childcare and anything else is a “crazy story”. When my story appeared, he briefed a lawyer to demand that if the story was not taken down, he would sue New Matilda and demand costs. That lawyer was also involved in the land transfer. Sanchez also accused residents of fabricating objections. Six months later, his childcare option looks very uncertain and from his point of view, the crazy story has got crazier. He his father and Brian Kirk now have to deal with an ICAC investigation. The residents meanwhile are hoping that a park which could be used by hundreds of elderly residents living above the site, might just become a reality. On Monday night, the Woollahra Council development committee unanimously decided that the Sanchez development application would be put on hold until after ICAC had completed its Inquiries.